Many sign makers love Oracal vinyl because it weeds like a dream. Oracal vinyls are also thinner than most other intermediate vinyls, which makes them more conformable. Both of these are wonderful benefits for any sign maker. But, as with many of the good things in life, there is a catch — Oracal’s thinner construction and great weeding characteristics come from a particularly dense face stock. “So what’s the downside?” you ask. Getting it off the liner. Because Oracal is slightly denser, it tends to be slightly stiffer than most calendared plotter films. In fact, Oracal invented the ultra calendared film. New thinking coupled with new chemistry make for a film that is easy to weed. But it also means it’s a little harder to remove from the release liner. Some of our customers have expressed frustration transferring Oracal films from the release liner once the weeding is done. So we and the wizards at Oracal have come up with solutions to this dilemma. The first solution is to use high tack app or transfer tape. We offer two tapes that are specifically formulated for use with ORACAL 651: our EnduraMASK High Tack paper tape and R-Tape’s ClearChoice AT65, which was added to the product line in September 2013. You may also like R-Tape’s ApliTape 4075, 4075 Conform, Main Tape’s PerfecTear Plus 775, or Preview Plus GXF101 clear tape. All are good choices for standard sign industry applications on smooth surfaces. The second solution is the Oracal Flip Tip. Even with high tack tape, sometimes the vinyl just does not want to let go of that liner. They were born and raised together, they made the journey to your shop together, and the vinyl just isn’t ready to abandon its lifelong friend! To pry those bosom buddies apart, simply flip the vinyl over so that the letters are now face down, with the back of the liner face up. Then peel the liner at a 180° angle back along the table surface (not upward towards you). 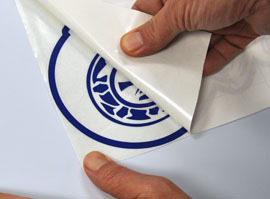 It sounds like a minor thing, but it will make a big difference in separating the vinyl from the liner. This works with many Oracal products, including our best-selling 651 glossy intermediate film and the matte finish 631 Exhibition Cal. But please note that 631 has a low tack removable adhesive used mainly for wall graphics. There are slightly different tape recommendations for this application, depending on the kind of wall surface. Click here to read all about it. So the next time you’re having trouble getting your Oracal letters to let go of the release liner, just remember to use high tack tape and try the Oracal Flip Tip!